Don’t miss the Olde Time Mountain Christmas Parade in Highlands NC Saturday. This annual holiday event is a true treasure and one which the community looks forward to each year. If you have witnessed this magical tradition you will not want to miss the annual parade this weekend. Join the Highlands NC community on Saturday, December 1st. This is a true small town event, put on by local groups, churches, businesses, fire departments, friends, neighbors and families. In fact, the parade is truly all about community in addition to the spirit of Christmas. All ages will be along Main Street to watch the long line of entries. It is a great idea to get there early to lay stake to a prime viewing spot. The annual Highlands Olde Mountain Christmas Parade will start at 11 am. If you are in town get out and join the fun. There will be homemade floats, horses, and motorcycles, as well as antique cars, fire engines, and other emergency service vehicles. A true local favorite is always the dancing ladies of the Mountain Garden Club. Contact our team at Berkshire Hathaway HomeServices Meadows Mountain Realty today to learn about Highlands NC real estate. We welcome the opportunity to update you on current market conditions while helping you get to know the area like a local. Let our knowledge and experience serve as your guide to the area. 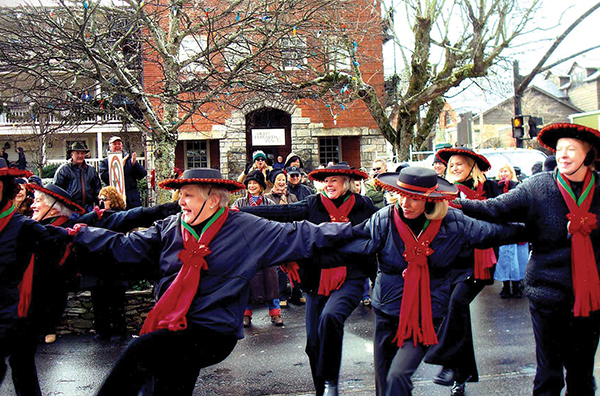 We hope to see you at the the Olde Time Mountain Christmas Parade in Highlands NC Saturday.